This is a critical warning to those deciding on whether to buy Joint Pain Relief Codes by former NBA player Jonathan Bender: We are dealing with a highly deceptive scam by the same guy behind Fat Diminisher! Please take your time and read this review to the end, as it is the only unbiased review of this product existing on the web at this time. Created in December 2015, Joint Pain Relief Codes claims to be the answer to the prayers of those suffering from ‘any kind of joint pain.’ The assumed author Jonathan Bender claims that his product is so powerful that ‘Big Medicine’ is now doing ‘their best’ to force him to take it down. But don’t listen to what that paid voice actor is telling you in the highly misleading presentation video, as you’ll be shocked after learning of what I discovered about it! This is a very unique scam because it looks like the person behind it completely stole the identity and website of a gifted basketball player who was forced to retire early because of chronic joint pain. So lets begin. Why is Joint Pain Relief Code a scam and why should you not believe all the positive reviews currently gracing the first pages of Google? Jonathan Bender is Either A Scammer or His Identity and Website Have Been Jacked! The only legit book Bender has written is called The Courtside CEO: Strategies to Leverage Your Talent and Pursue Your Passion, a book about his basketball story. It went on sale in February 2016 and you can buy it at Amazon. Now what I don’t understand is why Bender, a multimillionaire, will allow a scam like Joint Pain Relief Codes to be proudly displayed on his official website (I’m not even sure that he has a personal website!). Now why do I say this? 1. Joint Pain Relief Codes is Similar To Fat Diminisher! This cannot be a coincidence, right? To further confirm what I’m saying, take a look at the affiliate page of Fat Diminisher. Everything is the same, including the link address! 2. The Presentation Video is Hosted on A Wes Virgin YouTube Channel! Just like Fat Diminisher, the presentation video of Joint Pain Relief Codes is hosted on YouTube. Now since this product supposedly belongs to Jonathan Bender, the presentation video should be hosted on Bender’s YouTube channel, right? If your answer is yes, then why is it that the video is hosted on a Wes Virgin channel?! Mind you, this is NOT the same YouTube channel on which Virgin hosted his Fat Diminisher video. This only means what Virgin is one of those internet users that create multiple profiles on the same social website to gain exposure … and it also confirms that he is involved in this scam. Another thing to note is that the video comments section was disabled so that people cannot comment on it. Also note the title of the video. This is a very common practice of scammers, who do it in order to make it impossible for people to search for the video on YouTube or interact with it. By disabling the comments, it shows that the scammer is not ready, and does not want to answer the questions of his potential customers … a very serious red flag! I happened to have watched the video when the comments section was still available … and it had a lot of dislikes and negative comments. 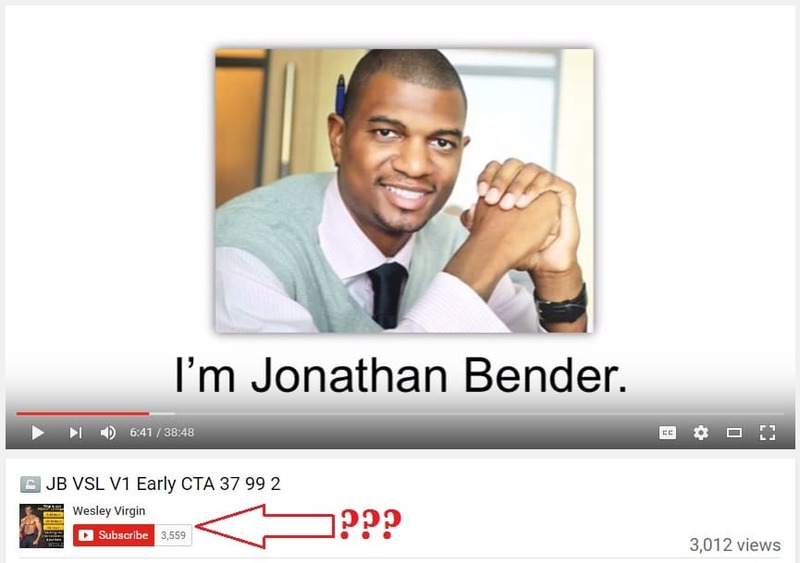 FYI: Jonathan Bender does NOT have a YouTube channel. 3. Fake Testimonials With Stolen Photos and Fake Actors! Seconds into the presentation video, you are shown videos of people testifying of the effectiveness of Joint Pain Relief Codes. Halfway through, you are again shown another set of testimonials. Then towards the end of the presentation, you are yet again shown another set of testimonials. I have to give it to the scammer for diversifying his fake testimonial sources and making it incredibly hard for me to trace or verify. In fact, I can’t trace how he got that middle aged man, the black woman and the old woman to make video testimonials that look real enough to deceive many. I also don’t know where he stole the photos of the young marathon girl from. Kudos man! But the hard-to-please Contra Health Scam refused to take the bait and kept on digging, until it found out that one of the people in the testimonials is a Fiverr.com actor. Eureka! Here is the link to her Fiverr.com page. This particular actor has been involved in numerous scams in a variety of niches like forex, real estate, etc. as you can see from her page. Let me remind you that nothing good ever comes out of any product you see people like her endorsing. Rest assured that they have never, and will never use the products they praise in testimonial videos. All they are interested in is getting their $5 and they basically don’t care if the products they are endorsing will benefit those who will actually spend the money to buy them. ADVICE: Stay away from any product with Fiverr.com and stolen photo testimonials! Final Recommendation: DON’T BUY Joint Pain Relief Codes. It is A SCAM! I don’t even want to start debunking the so-called ‘3 myths about joint pain’ that the scammer is trying to brainwash you with. Fact is that doctors and orthopedists never tell their patients such things in the first place! Please make sure you ignore the pop-up ‘refusing’ to let you go without having access to ‘The Secret Joint Pain Relief Codes.’ As every regular Contra Health Scam reader already knows, scammers resort to such pressure tactics as a last, desperate effort to make you buy their sham product. So don’t fall for it! Before I end this review, I have to let you guys know that I’m not really sure that Jonathan Bender is the owner of the website JonathanBender.com. Even though the domain was registered in 2007, it contains next to nothing and attracts almost zero traffic, i.e, it is very unpopular. This is strange considering the fact that Bender himself has been featured in highly popular news portals and magazines such as Forbes, Sports Illustrated and ESPN dating as far back as 2006. So don’t trust that website, at least for now. If you have used Joint Pain Relief Codes, I would like to hear from you. Kindly share your experience with the product in the comments section. Thank you! Looking at your review of the product and your website in general, it is pretty clear that you are just another Clickbank affiliate trying to make some quick bucks, which is not bad. I too am an affiliate. However, your review cannot be trusted because it is just too superficial and one-sided. And as for the claim that you ‘bought the program and it worked,’ I have a question for you: Did you also buy and try the other products you’ve reviewed? I too am a member. In any case, your survey can’t be trusted on the grounds that it is just excessively shallow and uneven. What’s more, with respect to the case that you ‘purchased the project and it worked,’ I have an inquiry for you: Did you additionally purchase and attempt alternate items you’ve evaluated? I found the Joint Pain Relief Codes. My friend Amy had a similar problem, but she is 20 years older than me. She’s gone through a lot of surgeries, medicine and pain. I tried the codes. They worked for me. I shared the codes with Amy, and they used to work for her. If somebody has any level of joint pain, and my testimonial helps one person to take a step towards healing, then, this time, wasworthy. I showed up with joint issues as I invest a lot of time on feet and also I love to put on attractive shoes with heels. I do not have extreme discomfort, but I do not intend to worsen my situation. I made a decision to take a training course of therapy K-laser therapy http://englintonmedical.com/services/k-laser/ near my house, but I was a bit skeptical guarantee to heal basically any individual in simply a couple of treatments lasting from 5 to 30 minutes. Is it truly fine? Share your results after the procedure.